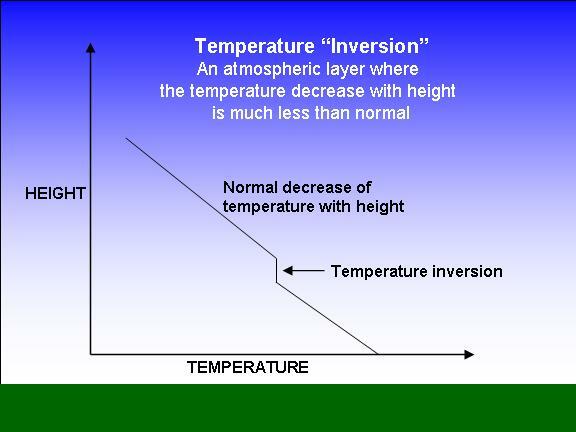 A temperature inversion is a thin layer of the atmosphere where the normal decrease in temperature with height switches to the temperature increasing with height. An inversion acts like a lid, keeping normal convective overturning of the atmosphere from penetrating through the inversion. This can cause several weather-related effects. One is the trapping of pollutants below the inversion, allowing them to build up. If the sky is very hazy, or is sunsets are very red, there is likely an inversion somewhere in the lower atmosphere. This happens more frequently in high pressure zones, where the gradual sinking of air in the high pressure dome typically causes an inversion to form at the base of a sinking layer of air. Another effect that an inversion has is to make clouds just below the inversion to spread out and take on a flattened appearance. For instance, marine stratocumulus clouds over cold ocean waters; or the tops of thunderstorms when they reach the base of the stratosphere, which also forms a temperature inversion. Still another effect is to prevent thunderstorms from forming. Even in an air mass that is hot and humid in the lowest layers, thunderstorms will be prevented if an inversion in the lower atmosphere is keeping this air from rising. The conceptual opposite of a temperature inversion is an unstable air layer.